On April 4th, after Assad’s pilots dropped chemical weapons on Khan Sheikhoun, they then bombed a nearby hospital that was treating the victims. The Assad regime and Russia have a long-running strategy of attacking medical services. During the 2016 joint Russia-regime attack on besieged Aleppo, there were 73 attacks on medical facilities and personnel recorded in the city. Now hospital bombings are escalating again. 17 April 2017: Hospital in Jabal al-Zawiya, Idlib, targeted by four airstrikes – five medics and one Syria Civil Defence volunteer injured – UOSSM and SCD reports. 17 April 2017: Hospital in Damascus suburbs attacked killing one paramedic – UOSSM report. 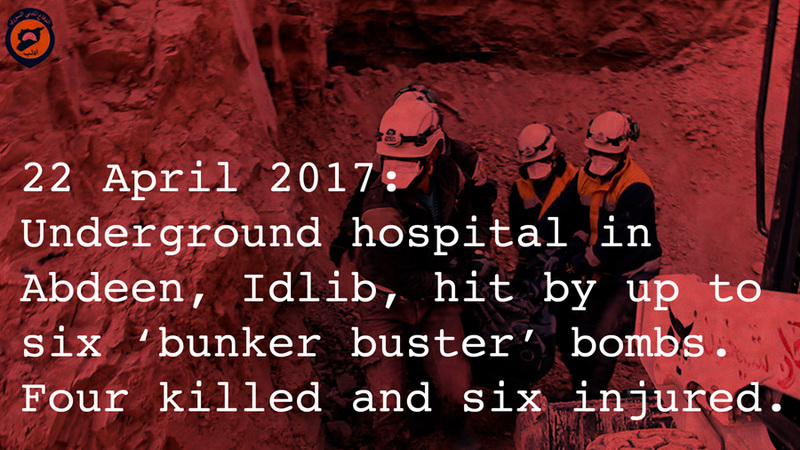 22 April 2017: Underground hospital in Abdeen, Idlib, hit by up to six ‘bunker buster’ bombs – Syria Civil Defence recovered remains of four killed and rescued six injured. 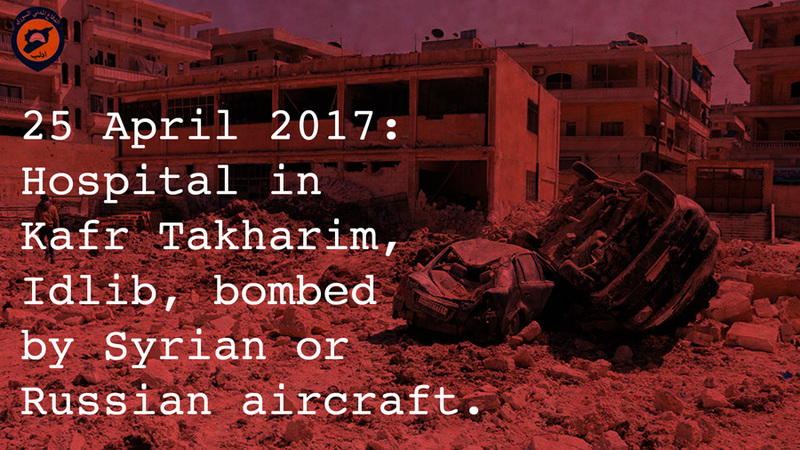 25 April 2017: Hospital in Kafr Takharim, Idlib, bombed by Syrian or Russian aircraft. 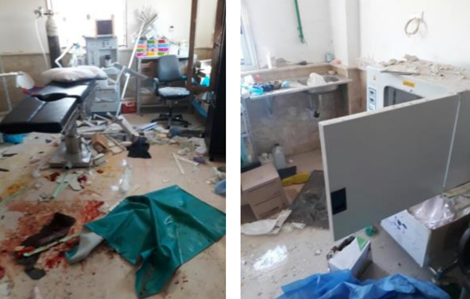 26 April 2017: Hospital in Daraa damaged in barrel bomb attack – dialysis unit destroyed – UOSSM report. 26 April 2017: Latamneh hospital in Hama suburbs attacked – lab technician rescued from under rubble – UOSSM report. 27 April 2017: Underground hospital in Maar Zeta bombed – Four paramedics killed while evacuating injured civilians – UOSSM report. 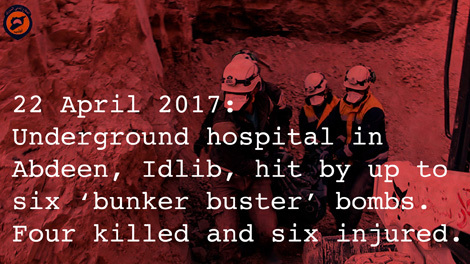 27 April 2017: Hospital in Deir al-Sharqi bombed four times – three intensive care patients killed – Idlib Health Directorate report. 28 April 2017: Maternity hospital in Kafr Takharim, Idlib province, damaged by at least two air strikes – Save The Children report. 28 April 2017: Al Na’eema field hospital in Daraa province attacked. Chemical attacks are war crimes. Hospital bombings are also war crimes. Protect Civilians: We need a fresh start for Syria. UK policy on Syria needs a fresh start: Read our proposals. The chemical attack by Assad on Khan Sheikhun was the deadliest since 2013. But it was only the most recent of many attacks breaking the 2013 chemical weapons deal. Here in the UK, politicians on all sides must now face the cost of Parliament’s failure to hold Assad to account in 2013. The UK Government needs to face the consequences not just of failure in 2013, but of failure throughout six full years to protect civilians in Syria: failure to ground Assad’s air force, failure to airdrop aid to besieged civilians, failure to protect civilians as they fled Syria, failure to take in some of the youngest and most vulnerable of Assad’s victims. If Russia continues to shield Assad at the UN, other permanent members of the Security Council including the UK must now join the US in taking measures to end impunity. The UK must show leadership to ensure that the international response centres on civilian protection. The 2013 chemical weapons deal failed to protect civilians because it only focused on one class of weapon, not on ending violence. In December 2013 after the chemical weapons deal, Assad escalated the regime’s barrel bombing of civilians. Syrians worry that Assad will now once more escalate against besieged civilians with artillery and conventional air attacks. All Assad regime attacks on civilians need to be stopped. The Khan Sheikhun attack came in the same week that the EU hosted its Brussels conference on Syria. Assad and his allies have shown their contempt for EU efforts. Despite the scale of crimes committed by the Assad regime, by Russia, and by Iran, the EU has not imposed a single sanction against Russia for its actions in Syria, and the EU is selling aircraft to Iran which uses civilian airliners to resupply the regime with fighters and arms. Diplomacy without pressure has failed. The UK and its allies now need to increase both economic and military pressure against Assad and his allies. UK policy on Syria needs a fresh start. Read our proposals in more detail here. Throughout 2016, more Russian air attacks killed civilians in Syria than Coalition air attacks did in all Syria and Iraq. This year, that has changed. 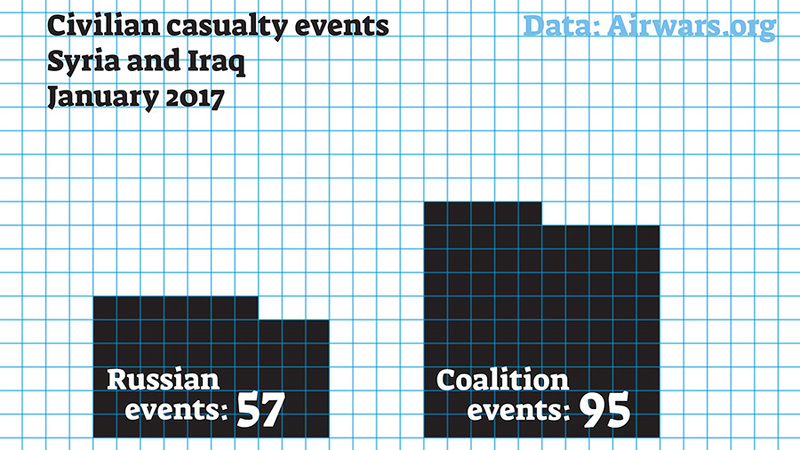 In January, February, and March, in Syria and Iraq, more Coalition air attacks killed civilians than Russian attacks did. In Syria alone, Coalition forces killed at least 260 civilians in March, compared to 224 civilians killed by Russia, according to the Syrian Network For Human Rights, (SNHR). 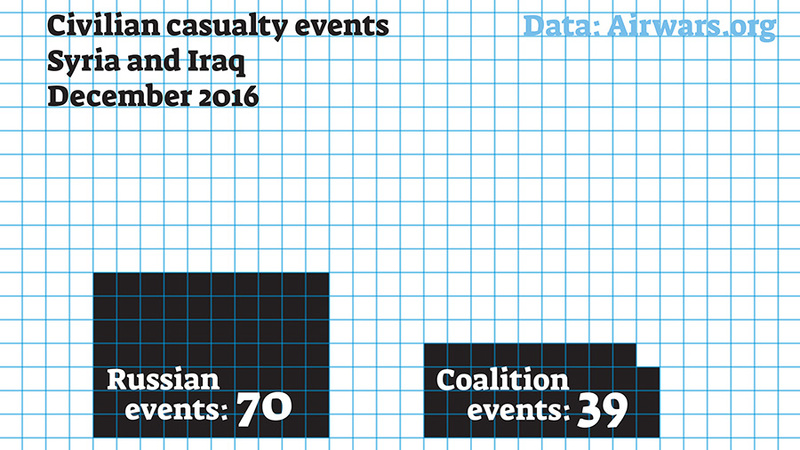 SNHR reports that in March the Coalition was responsible for more massacres in Syria than any other party. SNHR defines a massacre as an incident involving the killing of at least five peaceful individuals at the same time. At least 50 civilians were reported killed in a 22 March Coalition airstrike on al Badiya school west of Raqqa. The school was used as a shelter for people fleeing the fighting. Syrian organisations in the UK have called for an urgent investigation, and for a review of Coalition policy on civilian protection. UK failure to protect civilians adds to the human misery in Syria, undermines the UK’s moral authority, and undermines the UK’s strategic aims of fighting extremism and resolving the refugee crisis. The UK is a senior partner in the Coalition. A British officer serves as Coalition deputy commander. 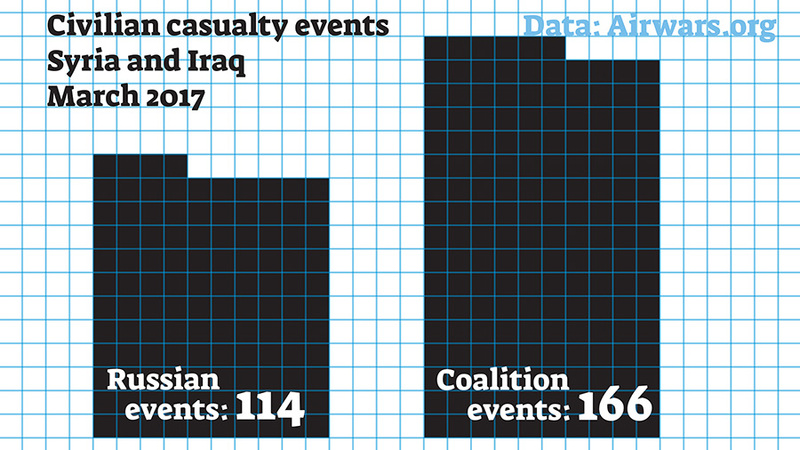 The UK is co-responsible for Coalition actions. We are all responsible for the consequences. Please add your name to our petition for a fresh start on Syria: Call on the UK Government for a new plan to protect civilians. In the past six years of the Syrian crisis, the UK has had plans for talks (and more talks), plans to contain the misery to the region (aid and more aid), plans to shut out refugees (more money for fences and less for rescues). Plans to stop chemical weapons (but not barrel bombs, cluster bombs, firebombs). Plans to fight ISIS (but not Assad who caused the crisis). After six years, talks have produced nothing, the misery gets worse, refugee numbers keep rising, chemical weapons and every other weapon are still in use. ISIS is still killing Syrians, along with Assad and Russia’s military, and their terrorist allies Hezbollah and Iranian forces. UK policy on Syria is broken. We need a plan to protect civilians. 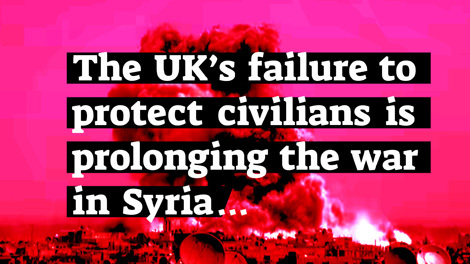 The UK’s failure to protect civilians is prolonging the war in Syria. Failure to protect civilians worsens the refugee crisis. Failure to protect civilians undermines the fight against terrorism. UK policy on Syria needs a fresh start. We call on the UK Government to bring forward a new plan to protect civilians in Syria and create an opportunity for peace. Please write to your MP and to UK government ministers. On Friday 7 April, Stop The War activists attempted to silence the voice of a Syrian refugee at their London protest by amplified chanting with megaphones. Hassan Akkad is a survivor of Assad’s torture prisons. The vast majority of Syrian refugees have fled the Assad regime’s violence. Stop The War has repeatedly shut out Syrian voices. It is time for public figures linked to Stop The War, such as Michael Rosen who has shown great concern for refugee rights, to now distance themselves from this bullying behaviour. The Assad regime’s chemical attack on the town of Khan Sheikhoun drew condemnation from across the world, but no major action from the Stop the War Coalition, which opposes any action including sanctions against the criminal Assad regime. Stop the War says that it is against all UK and US military intervention in Syria. But when the US bombed Syrian civilians in the al Jina mosque in Aleppo province in March, where were the protests from Stop The War? When the Coalition bombed displaced people sheltering in al Badiya school, west of Raqqa, where were the protests from Stop The War? Now that Assad’s airfield is hit, they take to the streets. Their actions suggest that they have greater care for preserving Assad’s killing machine than for protecting civilians. It is time for all honourable anti war campaigners to separate from Stop The War. 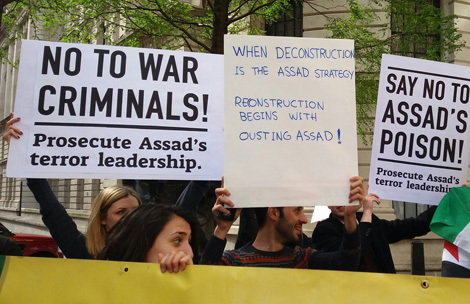 See also: Rethink Rebuild Society condemns ambivalence of ‘Stop the War’ to Assad’s war. Below: Hassan Akkad talks of his experience of Stop The War. 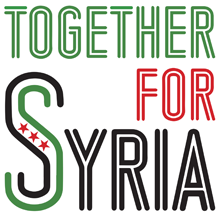 Syrian groups welcome this action. We wouldn’t start from here. The international community’s inaction over the past six years led to a position where Assad felt free to unleash the horrific chemical attack on Khan Sheikhoun. President Trump himself was until now a cheerleader for acquiescence in Assad’s war crimes and cannot evade sharing responsibility for the permission the world has effectively granted to the regime’s murderous actions. Shocking as the Khan Sheikhoun attack was, it was one more in a relentless and brutal war on the Syrian population that has killed almost half a million people and displaced around eleven million. While the use of chemical weapons induces a special revulsion, most civilians have been killed with conventional bombs and bullets. Following the 2013 chemical weapons deal, Assad escalated the barrel bombing of civilian areas, used with savage effect in the fall of Aleppo. 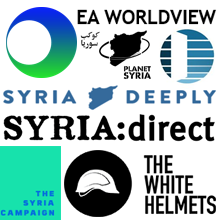 Nevertheless, Syrian opposition groups in the UK and internationally welcome the air strike as a precise and limited response to the particular horrors of the chemical attack. An action like this is the only way to slow down the killing, protect civilians and to push the Assad regime towards the conference table. Of course, had this happened in 2013, when the regime was at its weakest, it may have saved tens of thousands of lives. But the strike shows it is possible to stop Assad’s helicopters and jets. We now hope that it will be the first step towards a new resolve on the part of the international community to protect civilians and bring peace to Syria. Insisting, backed by a full roster of potential sanctions, the regime and Russia credibly commit to achieving an overall political settlement with the opposition’s High Negotiations Committee. We share the legitimate concerns that many will have about impulsive, unilateral actions on the part of a US government that has had no coherent policy for the region. 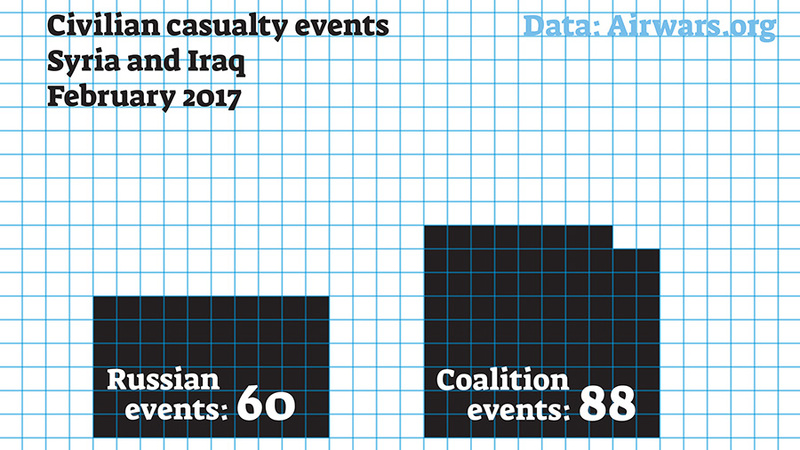 We have been openly critical of the disregard for civilian casualties demonstrated by the Coalition’s recent bombing campaign, including air strikes in March against a school in Raqqa which killed at least 33 civilians. But there are very many people across Idlib, other parts of Syria and throughout the Syrian diaspora who have some hope today. We stand with them. In the lead up to this week’s Brussels ‘Future of Syria’ conference, the EU’s foreign policy chief Federica Mogherini said that EU reconstruction planning can be ‘a dividend for peace’ to entice parties to compromise and begin a political transition. This was a delusion. Assad’s Economy Minister Adib Mayaleh had already said in February that future reconstruction contracts would primarily go to Russian, Iranian, and Chinese companies. Assad’s minister said the regime didn’t want any European nations to invest in Syria unless they publicly apologised to the Syrian Government and changed their own leaders! The Assad regime has destroyed its own cities and killed and tortured and starved hundreds of thousands to maintain power. Why would Assad now compromise for the promise of an EU handout when he is already backed by Russia and Iran? But for EU officials slow in understanding, the chemical attack against civilians should provide a final answer. Tuesday’s chemical weapons attack by the Assad regime on Khan Sheikhun in Idlib Province, Syria, was the deadliest since 2013. But it was only the most recent of many chemical attacks by Assad breaking the 2013 chemical weapons deal. EU governments need to face the contempt shown to their efforts by Assad and his allies. Here in the UK, Parliamentarians on all sides now need to look at the images of victims of this latest blatant crime against humanity; they must now face the cost of Parliament’s failure to hold Assad to account in 2013. The UK Government needs to face the consequences not just of its failure in 2013, but its failure throughout six full years to act to protect civilians in Syria: its failure to ground Assad’s jets and helicopters, its failure to airdrop aid to besieged civilians, its failure to protect civilians as they fled across borders and across the sea, its failure to take in some of the youngest and most vulnerable of Assad’s victims. If Russia continues to shield the Assad regime at the UN, other permanent members of the UN Security Council including the UK must now take measures to end impunity. Assad is showing contempt for every international attempt at peace, contempt for the international community, contempt for international law, and contempt for all humanity. Words are not enough. Shame is not enough. Act now to enforce existing UN resolutions and protect civilians.